Explore our delightful collection of fully set diamond wedding rings suitable for men and for women. Each design features wedding bands with diamonds all the way around for a spectacular show of brilliance and sparkle. Choose from our very wide collection or contact us for details on how we can custom make your full diamond wedding ring. Elegantly crafted in a combination of 18ct White Gold and Rose Gold, this 4mm channel set wedding ring holds 0.25cts of brilliant cut diamonds and features a contrasting edge created in 18ct Rose Gold. 3 row full diamond eternity ring, set with 1 carat of round brilliant cut diamonds, across a 3 channels of a 5.75mm wide band. Round Brilliant Cut Diamonds, Channel Setting, 1.00ct Diamonds, F/G Colour, VS Clarity, 5.75mm width. Available in 18ct Yellow Gold, 18ct White Gold, 950 Platinum and 950 Palladium. Wood boxed. Gift packaged. 3 weeks for delivery. Wide 6mm full diamond eternity ring, set with 2 carats of round brilliant cut diamonds across a double row design. Round Brilliant Diamonds, Pave Set, 2.0ct Diamonds, F/G Colour, VS Clarity, 6.05mm width. Available in 18ct Yellow Gold, 18ct White Gold, 950 Platinum and 950 Palladium. Wood boxed. Gift packaged. 3 weeks for delivery. Carré cut full diamond eternity ring, set with 3 carats of square Carré cut diamonds in a 4mm ring design. Carré Cut Diamonds, Channel setting, Full diamond set. 4.05mm width. 3 carat of diamonds. F/G colour VS clarity. Available in 18ct Yellow Gold, 18ct White Gold, 950 Platinum and 950 Palladium. Wood boxed. Gift packaged. 3 weeks for delivery. Carré cut full diamond eternity ring, set with 1 carat of square step-cut diamonds across a 2.5mm wide eternity ring design with channel setting. Carré Cut Diamonds, Channel setting, Full diamond set. 2.55mm width. 1.00cts diamonds. F/G colour VS clarity. Available in 18ct Yellow Gold, 18ct White Gold, 950 Platinum and 950 Palladium. Wood boxed. Gift packaged. 3 weeks for delivery. Carré cut full diamond eternity ring, set with 1.50cts of square cut diamonds in a 2 row 5mm channel set design. Carré Cut Diamonds, Channel setting, Full diamond set. 5mm width. 1.50cts diamonds. F/G colour VS clarity. Available in 18ct Yellow Gold, 18ct White Gold, 950 Platinum and 950 Palladium. Wood boxed. Gift packaged. 3 weeks for delivery. 2 carats of diamonds, within a full diamond eternity ring, 3.5mm wide, with a full channel setting. Carré Cut Diamonds, Channel setting, Full diamond set. 3.50mm width. 2.05cts diamonds. F/G colour VS clarity. Available in 18ct Yellow Gold, 18ct White Gold, 950 Platinum and 950 Palladium. Wood boxed. Gift packaged. 3 weeks for delivery. 1.50cts of dazzling Carré cut diamonds stunningly set in to a full eternity ring with bar setting across a 2.8mm wide band. Carré Cut Diamonds, Bar setting, Full diamond set. 2.80mm width. 1.50cts diamonds. F/G colour VS clarity. Available in 18ct Yellow Gold, 18ct White Gold, 950 Platinum and 950 Palladium. Wood boxed. Gift packaged. 3 weeks for delivery. Princess cut diamond wedding ring featuring a channel setting with diamonds all of the way around. Precision channel set with 1 carat of natural Princess cut diamonds across a court profile band. Full Set princess cut diamond wedding ring. Channel set princess cut diamonds are slightly offset to align a full channel with between 0.85ct - 1 carat in total of diamonds. Available in a range of metal choices. G colour and VS1 clarity as standard. Please allow 4 weeks for completion. Sweeping curved channel set diamond wedding ring, channel set with 0.50 carats or round brilliant cut diamonds in a court profile 4mm or 5mm band. Sweeping channel, diamond wedding ring, holding 0.50 carats of round brilliant cut diamonds, within a flowing machine cut channel Diamonds are precision set in this court profile wedding ring, available in either 4mm or 5mm ring widths. Please allow 4 weeks for us to create this design in your metal choice and finger size. Flush set full diamond eternity ring, 3mm wide, holding 0.24cts of round brilliant cut diamonds within flush settings around the ring. Round Brilliant Diamonds, Flush Set, 0.24ct Diamonds, F/G Colour, VS Clarity, 3mm Width. Available in 18ct Yellow Gold, 18ct White Gold, 950 Platinum and 950 Palladium. Wood boxed. Gift packaged. 3 weeks for delivery. Full eternity ring channel set with Round Brilliant Cut Diamonds. Round Brilliant Diamonds, Channel Set, 0.41ct Diamonds, F/G Colour, VS Clarity, 2.35mm width. Available in 18ct Yellow Gold, 18ct White Gold, 950 Platinum and 950 Palladium. Wood boxed. Gift packaged. 3 weeks for delivery. Full eternity ring, set with 0.35cts of round brilliant cut diamonds, in a 2.20mm wide band with channel setting. Round Brilliant Cut Diamonds, Channel Setting, 0.35ct Diamonds, F/G Colour, VS Clarity, 2.20mm width. Available in 18ct Yellow Gold, 18ct White Gold, 950 Platinum and 950 Palladium. Wood boxed. Gift packaged. 3 weeks for delivery. Substantial 5.2mm wide band, 1 carat fully set eternity ring, holding 1 carat of round brilliant cut diamonds within a channel setting. Princess Cut Diamonds, Channel Setting, 1.00ct Diamonds, F/G Colour, VS Clarity, 5.20mm width. Available in 18ct Yellow Gold, 18ct White Gold, 950 Platinum and 950 Palladium. Wood boxed. Gift packaged. 3 weeks for delivery. 3 carat full diamond eternity ring, set with 3 rows of pavé set round brilliant cut diamonds, across a 6.75mm wide band. Round Brilliant Diamonds, Micro Pave Set, 3.0ct Diamonds, F/G Colour, VS Clarity, 6.75mm width. Available in 18ct Yellow Gold, 18ct White Gold, 950 Platinum and 950 Palladium. Wood boxed. Gift packaged. 3 weeks for delivery. Diamond encrusted 2 row full eternity ring, set with 2 carats of round brilliant cut diamonds across a 4.6mm wide band. Round Brilliant Diamonds, Claw Set, 2 carats of diamonds, F/G Colour, VS Clarity. 4.60mm width. Available in 18ct Yellow Gold, 18ct White Gold, 950 Platinum and 950 Palladium. Wood boxed. Gift packaged. 3-4 weeks for delivery. Full diamond eternity ring, set with 3.10cts of round brilliant cut diamonds across a 2 row design, 6.5mm wide. Round Brilliant Diamonds, Micro Pavé Set, 3.10ct Diamonds, F/G Colour, VS Clarity, 6.50mm width. Available in 18ct Yellow Gold, 18ct White Gold, 950 Platinum and 950 Palladium. Wood boxed. Gift packaged. 3 weeks for delivery. 1 carat princess cut diamond wedding ring, with channel setting across a medium weight flat court profile band. Precision set 3 mm diamond set wedding band. This ring holds a full channel of princess cut diamonds along a precision cut channel, in a flat court profile band. The total diamond weight is 1 carat and diamonds are graded G colour and VS1 clarity as standard, with approx. 4 weeks for shipping. Choose from 3 different widths for this 0.50 carat channel set round brilliant cut diamond wedding ring, fully channel set within a court profile band. With a choice of 2.5mm, 3mm or 3.5mm, this channel set diamond wedding ring holds round brilliant cut diamonds, fully set around the band of the ring. The band is a medium weight court profile with comfort fit, set with 0.50 carats of 1.25mm diamonds. This ring design takes around 4 weeks to create to your metal and finger size. Elegant, 2.4mm wide rub-over set full diamond eternity ring, set with 0.50cts of round diamonds within full bezel settings. Round Brilliant Cut Diamonds, Rub Over setting, 0.50ct Diamonds, F/G Colour, VS Clarity, 2.40mm width. Available in 18ct Yellow Gold, 18ct White Gold, 950 Platinum and 950 Palladium. Wood boxed. Gift packaged. 3 weeks for delivery. 2 Carat Russian wedding ring set, created with pavé diamonds across an elaborate 3 band design. Available in either 18ct Yellow, White and Rose Gold or 950 Palladium or 950 Platinum. 2.00cts of F VS1 Round Brilliant Cut diamonds. Supplied in wood box and gift wrapped. Please allow three weeks for delivery. Channel set diamond eternity ring set with a matching set of Princess Cut diamonds. Princess cut diamonds, F/G colour VS clarity, Channel setting, Court Profile, 2.7mm width, Precision setting. 1.00cts of diamonds, Available in 18ct Yellow Gold, 18ct White Gold, 950 Platinum and 950 Palladium. Wood boxed. Gift packaged. 3 weeks for delivery. Unique diamond band, or eternity ring, set with 1.65cts of princess cut diamonds alternately set within a checkerboard pattern. Princess Cut Diamonds, Flush Set, 1.65ct Diamonds, F/G Colour, VS Clarity, 4.30mm width. Available in 18ct Yellow Gold, 18ct White Gold, 950 Platinum and 950 Palladium. Wood boxed. Gift packaged. 3 weeks for delivery. Slender 2.25mm wide princess diamond full eternity ring, channel set with 0.62cts of high clarity diamonds. Princess Cut Diamonds. Channel Setting. F/G colour VS clarity. 2.25mm width. 0.62cts Diamonds. Available in 18ct Yellow Gold, 18ct White Gold, 950 Platinum and 950 Palladium. Wood boxed. Gift packaged. 3 weeks for delivery. A full diamond eternity ring set with a combination of marquise cut diamonds and round blue sapphires in an elegant eternity design. Marquise Cut diamonds and Round Brilliant Cut Sapphries, 0.80cts diamond weight F/G colour VS clarity and 0.44ct Sapphire. Each stone is set within a rub over bezel setting. 3.00mm width. Available in 18ct Yellow Gold, 18ct White Gold, 950 Platinum and 950 Palladium. Wood boxed. Gift packaged. 3 weeks for delivery. Double diamond set edge, full eternity ring, holding 0.50cts of round brilliant cut diamonds across a 4.3mm band. Round Brilliant Cut Diamonds, Double Row, Claw Set, 0.50ct Diamonds, F/G Colour, VS Clarity, 4.30mm width. Available in 18ct Yellow Gold, 18ct White Gold, 950 Platinum and 950 Palladium. Wood boxed. Gift packaged. 3 weeks for delivery. Fine 1.5mm full diamond eternity ring, set with high clarity round brilliant cut diamonds, 0.50cts in total diamond weight. Round Brilliant Cut Diamonds, Claw Setting, 0.50cts Diamonds, F/G Colour, VS Clarity, 1.5mm width. Available in 18ct Yellow Gold, 18ct White Gold, 950 Platinum and 950 Palladium. Wood boxed. Gift packaged. 3 weeks for delivery. Enjoy the sparkle of romance within each bezel of this full diamond eternity ring. Featuring 1 carat of dazzling white round brilliant cut diamonds styled with a sweeping effect across a 3mm band. Full Rub-Over Bezel Setting. Round brilliant diamonds. 1.00cts diamond weight. F/G colour VS clarity. 3mm width. Available in 18ct Yellow Gold, 18ct White Gold, 950 Platinum and 950 Palladium. Wood boxed. Gift packaged. 3 weeks for delivery. 3 ring Russian wedding ring set, comprising 1 carat of round brilliant cut diamonds across an interlocking 3 ring design with channel setting. Available in either 18ct Yellow, White and Rose Gold or 950 Palladium or 950 Platinum. 1.00cts of F VS Round Brilliant Cut diamonds. Supplied in wood box and gift wrapped. Please allow three weeks for delivery. Uniquely styled marquise cut diamond full eternity ring, created in a decadent, contoured interwoven design. A fully set Marquise cut diamond eternity ring set with 1.00ct of F colour VS clarity Marquise diamonds. Available in 18ct White Gold, 18ct Yellow Gold, 950 Palladium and 950 Platinum. Supplied in wood box and gift wrapped. Please allow three weeks for delivery. Medium weight court profile wedding ring, with full offset channel containing 0.50 carats of 1.25mm round brilliant cut diamonds in 4mm, 5mm or 6mm ring widths. Offered in a choice of 4mm, 5mm or 6mm widths, this court profile wedding ring, has a medium weight, and is fully channel set with 0.50 carats of G colour VS1 clarity round diamonds within an offset channel around one edge of this beautiful design. Created in a range of metal choices and finger sizes, please allow 4 weeks for this ring to be made. Choose from 4mm or 5mm for this offset channel, flat court, fully set diamond wedding ring. 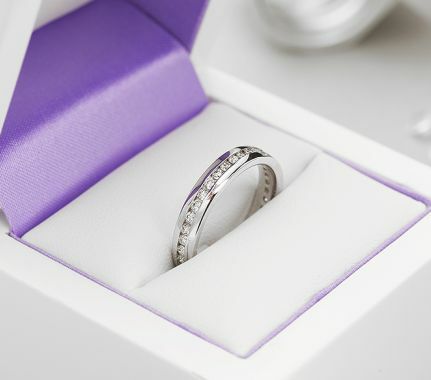 Fully set flat court wedding ring in a medium weight, created in your choice of 4mm or 5mm ring width. An offset channel follows one edge, containing 0.50 carats of round brilliant cut 1.25mm diamonds in G colour and VS1 clarity. Timescale is typically 4 weeks for this sleek diamond set wedding ring design. Wood boxed and gift packaged. Flat court wedding ring, in a choice of widths, fully set with 0.50 carats of round brilliant cut diamonds in a channel setting. Flat court profile with medium weight. Fully diamond set. Choose from 2.5mm 3mm or 3.5mm for the width. Channel set with 1.25mm of round brilliant cut diamonds. Total diamond weight 0.50 carats. Approx. 3-4 weeks for completion in your chosen finger size and metal. 1 carat fully set double channel diamond wedding ring with 5mm flat court profile band. A double channel design, flat court wedding ring, holding 1 carat of round brilliant cut diamonds around a 5mm wide band. The design features 1.25mm round diamonds of G colour and VS1 clarity precision held within this fully set band, which takes around 4 weeks to complete. A Stunning Fully Flush Set Diamond Wedding Ring. Exquisite wedding band fully flush set round brilliant cut diamonds with exposed sides allowing light to flow beneath the stones to aid more sparkle. Very pretty and unusual flush set diamond wedding ring featuring small round brilliant cut diamonds flush set in pairs across a 3mm wide ring. D Shape profile. 3mm width. 16 round brilliant cut diamonds flush set in pairs around the ring. 0.16cts total diamond weight 1.3mm diameter for each diamond. G colour VS2 clarity. Available in a wide range of metal choices. We can also custom make this design in alternative profiles and widths. Please allow 4 weeks for this exquisite wedding ring style. 1.05cts of Baguette cut diamonds set elegantly into the full channel setting with a court ring profile. Baguette cut diamonds. Channel setting. F/G colour VS clarity. 1.05cts diamonds. 2.7mm wide band. Court ring profile. Available in 18ct Yellow Gold, 18ct White Gold, 950 Platinum and 950 Palladium. Wood boxed. Gift packaged. 3 weeks for delivery. A full eternity ring with Baguette Cut diamonds vertically set around the channel setting. Baguette Cut Diamonds. Channel Setting. 1.50ct Diamonds. F/G Colour VS Clarity. Available in 18ct Yellow Gold, 18ct White Gold, 950 Platinum and 950 Palladium. Wood boxed. Gift packaged. 3 weeks for delivery. Fully diamond set wedding ring from the 'Entwine' wedding ring collection. Fully diamond set. Approx. 2.5mm. Round brilliant cut diamonds. 0.15cts total diamond weight. 950 Platinum. A perfect match with our part set and plain design from the collection or paired with our diamond solitaire design. (see related products below.) Wood boxed and gift packaged. An unusual wedding band with a matching set of Round Brilliant Cut diamonds that have been individually bezel set around the 4mm court profile band. .
Full diamond eternity ring, crafted with 1.50cts of round brilliant cut diamonds, held within bar settings. Round Brilliant Cut Diamonds, Bar Setting, 1.50ct Diamonds, F/G Colour, VS Clarity, 3.10mm width. Available in 18ct Yellow Gold, 18ct White Gold, 950 Platinum and 950 Palladium. Wood boxed. Gift packaged. 3 weeks for delivery. Baguette cut diamond eternity ring with a precision cut channel holding the sideways set diamonds. 0.75cts diamond weight. Baguette cut diamonds. F/G colour VS clarity. Each diamond is set lengthways along the channel. Court profile. 2.25mm width. Available in 18ct Yellow Gold, 18ct White Gold, 950 Platinum and 950 Palladium. Wood boxed. Gift packaged. 3 weeks for delivery. Beautifully styled Baguette and round diamond eternity ring featuring an end-to-end channel set arrangement of diamonds in a 3.2mm band. This delightful eternity ring maximises carat weight, with 1.25 carats of dazzling white diamonds set lengthways end-to-end in a unique arrangement. Enjoy a perfect finish, beautiful packaging and expert help from the Serendipity Diamonds team before and after your purchase. Round Brilliant and Baguette Cut Diamonds, Channel Setting, 1.25ct Diamonds, F-G Colour, VS Clarity, 3.20mm width. Available in 18ct Yellow Gold, 18ct White Gold, 950 Platinum and 950 Palladium. Wood boxed. Gift packaged. 4 weeks for delivery. Full diamond eternity ring styled with 1.30cts of channel set princess cut diamonds in a classic ring design. Princess cut diamonds, F/G colour VS clarity, Channel setting, Court Profile, 3mm width, Precision setting. 1.30cts of diamonds, Available in 18ct Yellow Gold, 18ct White Gold, 950 Platinum and 950 Palladium. Wood boxed. Gift packaged. 3 weeks for delivery. Full diamond eternity ring, set with a total of 3.30 carats of princess cut diamonds within a full channel setting. Princess cut diamonds, F/G colour VS clarity, 3.30cts weight, 4mm width, Court profile, F/G colour VS clarity. Available in 18ct Yellow Gold, 18ct White Gold, 950 Platinum and 950 Palladium. Wood boxed. Gift packaged. 3 weeks for delivery. Precision channel set diamond eternity ring set with 1.60cts of Princess Cut diamonds within a 3mm wide band. Princess cut diamonds. Full eternity ring. Channel setting. 3mm width. 1.60cts diamonds. F/G colour VS clarity. Court profile. Precision set. Available in 18ct Yellow Gold, 18ct White Gold, 950 Platinum and 950 Palladium. Wood boxed. Gift packaged. 3 weeks for delivery. Eternity ring with two channels fully set with a matching set of Princess Cut Diamonds. Princess Cut Diamonds. Channel Setting. F/G colour VS clarity. 5.10mm width. 1.50cts Diamonds. Available in 18ct Yellow Gold, 18ct White Gold, 950 Platinum and 950 Palladium. Wood boxed. Gift packaged. 3 weeks for delivery. Double channel fully set diamond eternity ring, holding 1.56cts of round diamonds across a 5.25mm wide band. Round Brilliant Cut Diamonds. Channel Setting. 1.56ct Diamonds. F/G Colour VS Clarity. 5.25mm width. Available in 18ct Yellow Gold, 18ct White Gold, 950 Platinum and 950 Palladium. Wood boxed. Gift packaged. 3 weeks for delivery. This exceptional full diamond eternity ring is set with 1 carat of Princess cut diamonds, within an offset channel setting. Princess Cut Diamonds, Offset Channel Setting, 1.00ct Diamonds, F/G Colour, VS Clarity, 4.20mm width. Available in 18ct Yellow Gold, 18ct White Gold, 950 Platinum and 950 Palladium. Wood boxed. Gift packaged. 3 weeks for delivery. A Eternity Ring with a 5.30 wide court ring profile band, Diagonally set channel with 1.50cts of Princess Cut Diamonds. Princess Cut Diamonds, Channel Setting, 1.50ct Diamonds, F/G Colour, VS Clarity, 5.30mm width. Available in 18ct Yellow Gold, 18ct White Gold, 950 Platinum and 950 Palladium. Wood boxed. Gift packaged. 3 weeks for delivery. 1 Carat bar set full eternity ring, precision set with over 1 carat of dazzling white square Princess cut diamonds around a 2.4mm wide eternity band. Princess Cut Diamonds, Bar Setting, 1.05ct Diamonds, F/G Colour, VS Clarity, 2.40mm width. Available in 18ct Yellow Gold, 18ct White Gold, 950 Platinum and 950 Palladium. Wood boxed. Gift packaged. 4 weeks for delivery. 3 carat baguette and round diamond eternity ring featuring a 4.75mm band, fully channel set with 3 carats of dazzling round brilliant-cut diamonds alternating with rectangular baguette cut diamonds. This decadent diamond eternity ring is a perfect example of one of the finest diamond eternity ring designs available, with an impressive show of diamonds. With 3 carats of diamonds, this exquisite diamond eternity ring features a full channel setting with 4.75mm ring width. In addition, all diamonds meet F-G colour for whiteness with a VS clarity grade. 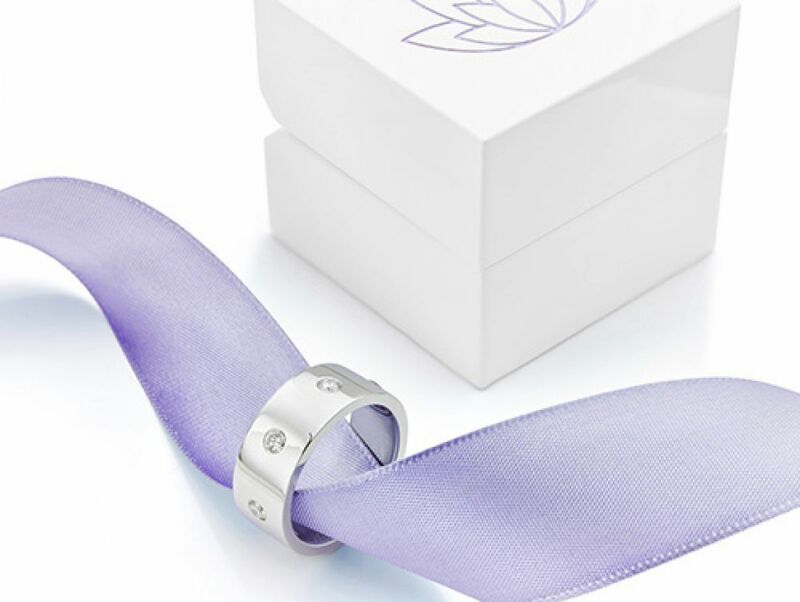 Beautiful packaging is included, and certification is available at no further cost by request at the time of placing your order. Worldwide shipping available and luxurious packaging. 2 carat round and baguette diamond eternity ring. Fully set with 2 carats of alternating round and baguette cut diamonds within a 3.9mm wide band with channel setting. Round & Baguette. Channel setting. 3.9mm width. 2cts of diamonds. F/G colour VS clarity. Available in 18ct Yellow Gold, 18ct White Gold, 950 Platinum and 950 Palladium. Wood boxed. Gift packaged. 4 weeks for delivery. Enjoy the spectacular arrangement of baguette cut diamonds with round brilliant cut diamonds, alternating within a full diamond eternity ring from the World famous Raphael Collection. Fully set baguette cut diamonds alternating with round brilliant cut diamonds. Full eternity ring design. Precision channel setting with a 3mm wide band. Choice of precious metals including 950 Platinum, 950 Palladium, 18ct White Gold, 18ct Yellow Gold and 18ct Rose Gold. A fully set eternity ring with stunning baguette cut diamonds running lengthways along the precision cut channel. Baguette cut diamonds. Precision set. 0.60cts weight. F/G colour VS clarity. Court profile. 2.5mm width. Available in 18ct Yellow Gold, 18ct White Gold, 950 Platinum and 950 Palladium. Wood boxed. Gift packaged. 3 weeks for delivery. A full channel set baguette cut diamond eternity ring, with diamonds elegantly set lengthways around the ring. Baguette cut diamonds. Channel setting. Court profile. 1.25cts weight. 2.7mm width. F/G colour VS clarity. Available in 18ct Yellow Gold, 18ct White Gold, 950 Platinum and 950 Palladium. Wood boxed. Gift packaged. 3 weeks for delivery. Full eternity ring with Baguette cut diamonds horizontally set along the precision cut channel. Baguette diamonds, Channel setting, 1.50cts weight, F/G colour VS clarity, Precision setting. Court profile, 3.3mm width. Available in 18ct Yellow Gold, 18ct White Gold, 950 Platinum and 950 Palladium. Wood boxed. Gift packaged. 3 weeks for delivery. A fully channel set diamond eternity ring with vertically set Baguette Cut diamonds. Baguette Cut Diamonds, Full Channel Setting, 3.08ct Diamonds, F/G Colour, VS Clarity, 5.02mm width. Available in 18ct Yellow Gold, 18ct White Gold, 950 Platinum and 950 Palladium. Wood boxed. Gift packaged. 3 weeks for delivery. A full eternity ring with Baguette Cut diamonds channel set vertically around the 3.9mm band. Baguette Cut Diamonds. Channel Setting. 2.00ct Diamonds. F/G Colour VS Clarity. 3.9mm width. Wood boxed. Gift packaged. 3 weeks delivery. Enjoy a spectacular show from this dazzling full diamond eternity ring which features alternating baguette and princess cut diamonds within a precision channel setting. Princess & Baguettes, Channel setting, Alternating design. Full diamond set. 2.65mm width. 1.00cts diamonds. F/G colour VS clarity. Available in 18ct Yellow Gold, 18ct White Gold, 950 Platinum and 950 Palladium. Wood boxed. Gift packaged. 3 weeks for delivery. This jaw dropping full diamond eternity ring is loaded with a sparkling 1.5 carats of alternating princess cut and baguette cut diamonds all held within a precision set channel. Princess cut diamonds alternating with baguette cut diamonds. Channel setting. Alternating design. Full diamond set. 3.2mm width. 1.50cts, F/G colour VS clarity. Available in 18ct Yellow Gold, 18ct White Gold, 950 Platinum and 950 Palladium. Luxuriously presented in presentation box and plain outer wrapping. Please allow around 4 weeks for delivery from the point of order. Full diamond eternity ring with 3.00cts of princess and baguette cut diamonds set alternately within a channel setting. Channel setting. Princess & Baguette diamonds. Alternating design. 3ct diamond weight. F/G colour VS clarity. 4.2mm ring width. Available in 18ct Yellow Gold, 18ct White Gold, 950 Platinum and 950 Palladium. Wood boxed. Gift packaged. 3 weeks for delivery. Enjoy the sparkle and brilliance of this Baguette and round diamond full eternity ring. Suitable as a full eternity ring or full diamond wedding ring, this elegant design features a full channel setting, available in a choice of precious metals including Platinum, White Gold, Yellow Gold, Rose Gold and Palladium. Baguette & Round diamond full eternity or wedding ring. Channel setting. 2.25mm width. 0.50cts total weight. F-G whiteness colour grade. VS clarity. Available in 18ct Yellow Gold, 18ct White Gold, 950 Platinum and 950 Palladium. Beautifully presented in bespoke Serendipity Diamonds packaging. Please allow 4 weeks for this design to be crafted. A full eternity ring with an offset channel holding a matching set of Princess Cut diamonds. Princess Cut Diamonds, Channel Setting, 1.00ct Diamonds, F/G Colour, VS Clarity, 4.50mm width. Available in 18ct Yellow Gold, 18ct White Gold, 950 Platinum and 950 Palladium. Wood boxed. Gift packaged. 3 weeks for delivery. Fully set princess cut diamond eternity ring featuring bar set princess cut diamonds with a total carat weight of 1.50cts. Princess Cut Diamonds, Bar Set, 1.50ct Diamonds, F/G Colour, VS Clarity, 2.80mm width. Available in 18ct Yellow Gold, 18ct White Gold, 950 Platinum and 950 Palladium. Wood boxed. Gift packaged. 3 weeks for delivery. Fully diamond set, princess cut diamond eternity ring with 1 carat of diamonds channel set across a 4.5mm band. Princess Cut Diamonds, Channel Set, 1.00ct Diamonds, F/G Colour, VS Clarity, 4.50mm width. Available in 18ct Yellow Gold, 18ct White Gold, 950 Platinum and 950 Palladium. Wood boxed. Gift packaged. 3 weeks for delivery. Fully diamond set, this offset channel design holds 0.31cts of round brilliant cut diamonds across a 3.3mm wide ring design. Round Cut Diamonds. Channel Setting. 0.31cts Diamonds. F/G Colour. VS Clarity. 3.33mm width. Available in 18ct Yellow Gold, 18ct White Gold, 950 Platinum and 950 Palladium. Wood boxed. Gift packaged. 3 weeks for delivery. Eternity ring with Round Brilliant Cut diamonds channel set into the 2mm wide band. Round Brilliant Cut Diamonds, Channel Setting, 0.33ct Diamonds, F/G Colour, VS Clarity, 2.00mm width. Available in 18ct Yellow Gold, 18ct White Gold, 950 Platinum and 950 Palladium. Wood boxed. Gift packaged. 3 weeks for delivery. Three rows of Round Brilliant cut diamonds which have been Pavé set within this dazzling full eternity Ring. 3 Rows Round Brilliant Cut Diamonds, Micro Pave Setting, 3.10ct Diamonds, F/G Colour, VS Clarity, 7mm width. Available in 18ct Yellow Gold, 18ct White Gold, 950 Platinum and 950 Palladium. Wood boxed. Gift packaged. 3 weeks for delivery. Full diamond eternity ring, with double channelled edge, holding 0.50cts of round brilliant cut diamonds across a 4.65mm wide ring design. Round Brilliant Cut Diamonds,Channel Setting, 0.50ct Diamonds, F/G Colour, VS Clarity, 4.65mm width. Available in 18ct Yellow Gold, 18ct White Gold, 950 Platinum and 950 Palladium. Wood boxed. Gift packaged. 3 weeks for delivery. Full diamond eternity ring, with double edge channels, holding 1 carat of round brilliant cut diamonds in a 5.5mm wide ring design. Round Brilliant Cut Diamonds,Channel Setting, 1.00ct Diamonds, F/G Colour, VS Clarity, 5.55mm width. Available in 18ct Yellow Gold, 18ct White Gold, 950 Platinum and 950 Palladium. Wood boxed. Gift packaged. 3 weeks for delivery. Full diamond eternity ring with diagonally set channel, holding 0.77cts of round brilliant cut diamonds in a 5.3mm wide band. Round Brilliant Cut Diamonds, Channel Setting, 0.77ct Diamonds, F/G Colour, VS Clarity, 5.30mm width. Available in 18ct Yellow Gold, 18ct White Gold, 950 Platinum and 950 Palladium. Wood boxed. Gift packaged. 3 weeks for delivery. Elegant 2 row fully set diamond eternity ring, holding 1.55cts of pavé set diamonds across a 3.8mm wide ring design. Double Row Round Brilliant Cut Diamonds, Micro Pavé Setting, 1.55ct Diamonds, F/G Colour, VS Clarity, 3.80mm width. Wood boxed, Gift packaged, 3 weeks delivery. Full diamond eternity ring, beautifully set with 1 carat of high clarity diamonds, within a bar set 2.9mm band. Round Brilliant Cut Diamonds, Bar Setting, 1.00ct Diamonds, F/G Colour, VS Clarity, 2.90mm width. Available in 18ct Yellow Gold, 18ct White Gold, 950 Platinum and 950 Palladium. Wood boxed. Gift packaged. 3 weeks for delivery. Luxurious 2.80 carat full diamond eternity ring, set with round brilliant cut diamonds, precision set along a 5.3mm design. Round brilliant diamonds. 2.80cts diamonds. F/G colour VS clarity. 5.3mm ring width. Precision setting Available in 18ct Yellow Gold, 18ct White Gold, 950 Platinum and 950 Palladium. Wood boxed. Gift packaged. 3 weeks for delivery. Uniquely styled, offset channel full diamond eternity ring, set with 0.51cts of round brilliant cut diamonds with a combined satin and polished finish. Full channel. 4.15mm ring width. 0.51cts diamonds. F/G Colour, VS Clarity. Precision set. Available in 18ct Yellow Gold, 18ct White Gold, 950 Platinum and 950 Palladium. Wood boxed. Gift packaged. 3 weeks for delivery. 3.10cts of round brilliant cut diamonds, claw set within a 3.9mm wide full diamond eternity ring. 3.10cts diamonds. Round brilliant cuts. Claw setting. Full eternity ring. 3.9mm ring width. F/G colour VS clarity. Available in 18ct Yellow Gold, 18ct White Gold, 950 Platinum and 950 Palladium. Wood boxed. Gift packaged. 3 weeks for delivery. Round diamond full eternity ring with channel setting, holding a total of 0.41cts of round brilliant cut diamonds. Round brilliant diamonds, fully set, Channel setting, 2.6mm width, 0.41cts diamonds, F/G colour VS clarity. Available in 18ct Yellow Gold, 18ct White Gold, 950 Platinum and 950 Palladium. Wood boxed. Gift packaged. 3 weeks for delivery. Full set Eternity Ring with Round Brilliant Cut Diamond in a channel setting. Round diamonds. F/G colour VS clarity. Channel setting. 0.90cts weight. 3mm width. Court profile. Available in 18ct Yellow Gold, 18ct White Gold, 950 Platinum and 950 Palladium. Wood boxed. Gift packaged. 3 weeks for delivery. Matching set of Round Brilliant Diamonds channel set into a full eternity ring. Channel setting. 1ct diamond weight. 3.1mm width. F/G colour VS clarity. Round brilliant diamonds. Available in 18ct Yellow Gold, 18ct White Gold, 950 Platinum and 950 Palladium. Wood boxed. Gift packaged. 3 weeks for delivery. 2 Carat full diamond eternity ring, created with a 4mm wide band, precision set with round brilliant cut diamonds. 2ct diamond weight. F/G colour VS clarity. 4mm width. Channel setting. Court profile. Available in 18ct Yellow Gold, 18ct White Gold, 950 Platinum and 950 Palladium. Wood boxed. Gift packaged. 3 weeks for delivery. A 4.7mm eternity band channel set with Round Brilliant Diamonds. 3 Carat diamond weight, F/G colour VS clarity, 4.7mm width, Court ring profile. Round brilliant diamonds. Precision setting. Available in 18ct Yellow Gold, 18ct White Gold, 950 Platinum and 950 Palladium. Wood boxed. Gift packaged. 3 weeks for delivery. Beautifully crafted and precision claw set full diamond eternity ring featuring 0.75 carats of sparkling white diamonds, held within a fully set eternity band measuring 2mm in width. Round brilliant diamonds. F-G colour VS clarity, 0.75cts diamonds, 2mm ring width, claw setting. Court profile. Available in 18ct Yellow Gold, 18ct White Gold, 950 Platinum and 950 Palladium. Wood boxed. Gift packaged. 3 weeks for delivery. Full diamond eternity ring, set with 1 carat of round brilliant cut diamonds within claw settings and a 2.25mm wide band. Claw setting. 1.00cts diamonds. Round brilliant cuts. F/G colour VS clarity. 2.25mm width. Available in 18ct Yellow Gold, 18ct White Gold, 950 Platinum and 950 Palladium. Wood boxed. Gift packaged. 3 weeks for delivery. Gift packaged. 3 weeks delivery. Full Claw Set Round Brilliant Cut Diamond Eternity Ring Round brilliant diamonds. Claw setting. 2.00cts diamonds. F/G colour VS clarity. 3.25mm ring width. Available in 18ct Yellow Gold, 18ct White Gold, 950 Platinum and 950 Palladium. Wood boxed. Gift packaged. 3 weeks for delivery. Beautifully styled 4.35mm diamond eternity ring, fully grain set with 0.80cts of round brilliant cut diamonds. 0.80cts diamonds. 4.35mm width. Central round brilliants. F/G colour VS clarity. Claw settings. Available in 18ct Yellow Gold, 18ct White Gold, 950 Platinum and 950 Palladium. Wood boxed. Gift packaged. 3 weeks for delivery. Fully set round diamond eternity ring with 1 carat of bar set round brilliant cut diamonds in a 2.5mm wide band. Round Brilliant Cut Diamonds, Bar Setting, 1.00ct Diamonds, F/G Colour, VS Clarity, 2.50mm width. Available in 18ct Yellow Gold, 18ct White Gold, 950 Platinum and 950 Palladium. Wood boxed. Gift packaged. 3 weeks for delivery. 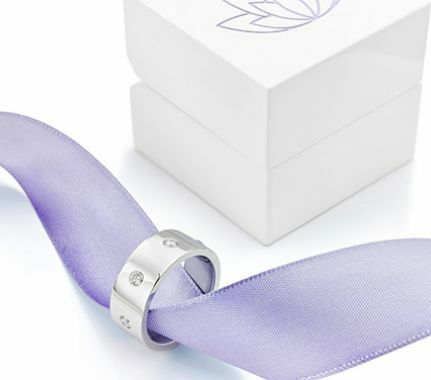 Our fully set diamond wedding rings are wedding bands with diamonds all the way around. If you are looking for a wedding band with diamonds all around, we have many styles for men and for women. We have simple designs with spaced flush-set diamonds, or more intricate diamond wedding rings, fully channel set with diamonds. Choose designs with square Princess cut diamonds set all the way around, or opt for the more popular round brilliant-cut styles in a choice of claw, pave or channel settings. 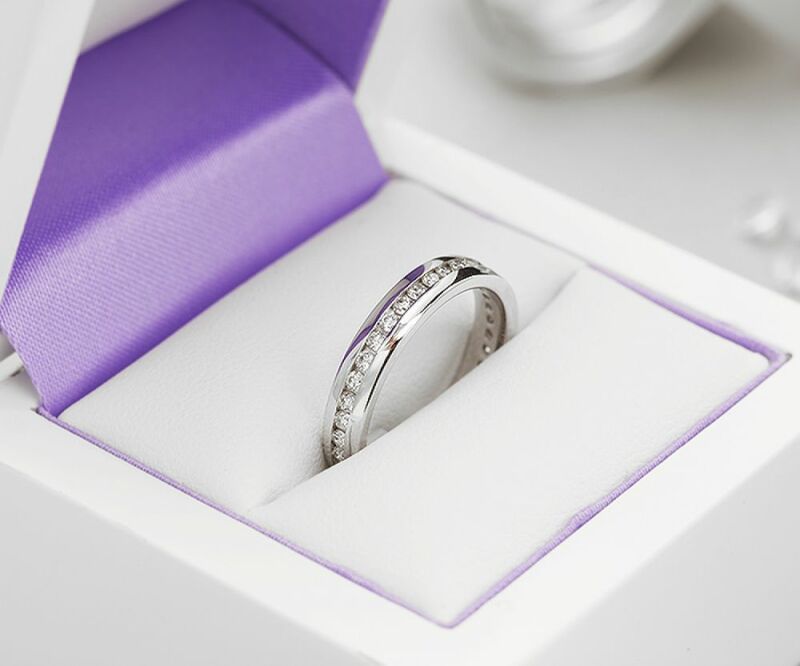 All of our fully set diamond wedding rings come in a choice of precious metals including 950 Platinum, 950 Palladium, 18ct White Gold, 18ct Rose Gold and 18ct Yellow Gold.